This is sad. Carla Cohen, the co-founder of Politics & Prose, that little literary gem in Cleveland Park, died yesterday at the age of 74. She battled a rare cancer of the bile ducts, and her obit was published in the Washington Post. Carla Cohen, the co-founder of Washington literary institution Politics & Prose, died this morning. She was 74. 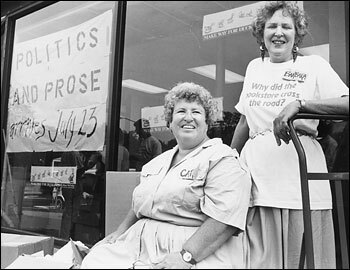 Politics & Prose was founded 26 years ago, and was established to be a breeding ground for progressive dialogue. It eventually became a famous institution, with politicos like Jim Lehrer holding events to sell books there. With deep sorrow, I am writing to inform our friends and neighbors that my beloved store co-owner Carla Cohen died this morning. For all of us here at Politics & Prose, it is difficult to believe that someone larger than life is gone, and I will deeply miss my friend and partner. In lieu of flowers, her family has requested that contributions may be made to Jews United for Justice, the Washington Literacy Council or Community Hospice. A funeral will be held at Tifereth Israel, 7701 16th Street, N.W. at 1:30 p.m. on Wednesday, October 13th. The store will be closed from 12- 4 p.m. on that day. We will have a memorial service in the store at a date to follow in November. Please read the obituary from the Washington Post here. We welcome and encourage your condolences, tributes, and memories here.